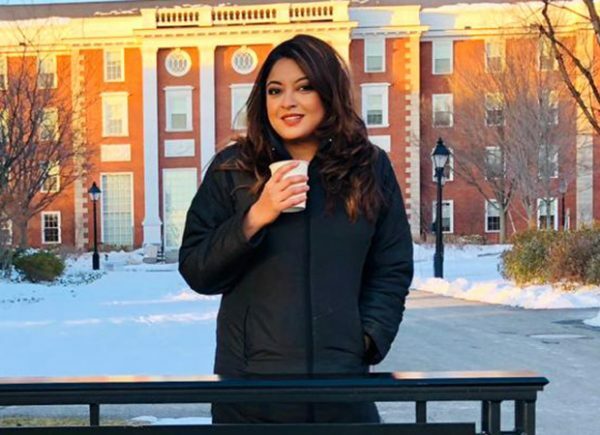 Tanushree Dutta may not be in India at the moment. In spirit, she continues to be the lord of the ring. She tells Subhash K Jha all that she has been up to. How was your lecture stint at the Harvard Business School? So yes, the guest speaker stint at Harvard went well. I did two panels at the conference and had a great feedback from the students and other guest speakers. The first panel had quite a few guests so I put in my inputs. The second panel was good as it was just the two of us journalist Pankaj Pachauri and myself discussing media, movies and internalized misogyny in society and representation of it in popular culture. Did you get ample opportunity to put your thoughts and ideas forward? The first panel didn’t give me much scope to add my insight. But Harvard created a second opportunity so the discussion with Pankaj went very well. I’m happy that I was able to visit the Harvard campus and spend some time there. You have a film on the #MeToo movement coming up? Yes, I’m looking forward to the release of Inspiration. But it’s not what it’s being made out to be. It’s a short film that is not fiction nor inspired by #MeToo stories contrary to recent reports. It is actually a motivational and inspirational genre aimed at guiding young newcomers to the film and media industries or any other field. Do you play the anchor in the film? No. I’m playing myself but it’s not specified in the film. It is a new format. You have to watch it to understand. It’s just 20 min so fully packed with my insight. Short, crisp, concise and very direct. It releases on March 8. You haven’t been seen on screen for the longest time, not counting the innumerable TV interviews you gave recently? I’m coming back on screen after almost nine years and I didn’t just want to entertain but do something that helps or motivates or guides someone out there who is struggling with difficult choices. You’ve moved away from being a Bollywood actor? Yes, I’m slowly moving on from being an actor and entertainer to getting into thought leadership and social impact scene. This just felt the natural thing to do. I guess we all grow up eventually. With great blessings comes great responsibility. God has been very kind to me. It’s time to express that gratitude. I am sure there will be many hats for you to wear in the coming months? Yes, I think so too. I’m doing several events here in US as keynote speaker on a range of topics from women empowerment to spirituality and holistic healing. Basically trying to put it put out there in a gist and sum of all that I’ve learnt and experienced in my journey so far in life. You have a mission now? It’s getting clearer by the day. Good times ahead. Let’s see what else is in store for me. The satisfaction in this is beyond I can express in words. No beauty pageant crown or movie star adulation can compare to the joy I’m feeling now in doing what I’m doing. So would you change the earlier part of your career if you had a choice? I mean, that was great too for that time and I’m grateful for it but this is something else altogether. Is Aamir Khan-starrer Lal Singh Chaddha similar to Salman Khan-starrer Bharat, a la Dangal and Sultan? Taylor Swift: Is Real Hair Coming Back Into Fashion? Does Cameron Diaz Have A Secret – Or A Lame Stylist?